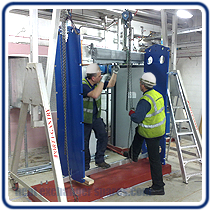 If access is poor or your plate heat exchangers are simply too big to be installed in one piece, our engineers can flat pack them for ease of transporting and positioning. The heat exchangers are broken down in to their key components and palletised ready for transporting to the plant room. Following a site survey the flat packed heat exchanger is positioned in line with the plant room drawing, rebuilt and pressure tested. As the work is undertaken by our own engineers your 12 month warranty is not affected. This is a common problem when refurbishing existing buildings but can also affect new builds. When building a new office block at Canary Wharf (London). 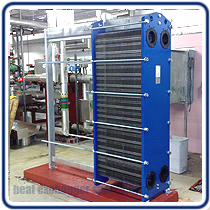 The Primary Contractor required four 3700kW heat exchangers, weighing 8000kG each, for the air conditioning. These were too big for the goods hoist and therefore had to be broken down to their component parts (the frame plate still weighed 2000kG each) and lifted to the 30th floor plantroom via tower crane. The parts were then transported across the newly built floor, to their final position and re-assembled. Once our work was complete, the plantroom walls were built around the heat exchangers.